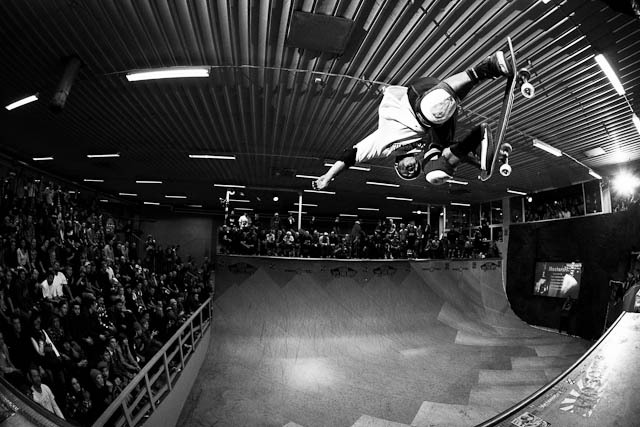 The one and only annual Vert Attack halfpipe skateboard contest is going to continue the success story in 2012 with the Vert Attack 6 contest taking place over two days, January 27th and 28th! Vert Attack has grown from a small local competition to a fantastic international vert festival but still kept its integrity and roots. Vert Attack is for everyone that loves (mid)vert or Folkvert – peoples vert as we call it there. After an insane contest last year with skaters from all over the world (just a few names: Christian Hosoi, Steve Caballero, Neal Hendrix, Alex Perelson, Jeff Hedges, Rune Glifberg, Nicky Guerrero, Anders Tellen, Sam Beckett and Jake Anderson who won the pro contest!) turning up for this international but very laid-back contest, it’s time to keep this tradition moving forward. Check out some great photos from last year’s event taken by Nils Svennson and the following video. Vert Attack is one of the greatest competitions around so make sure to save yoyr day on January 27th and 28th 2012!